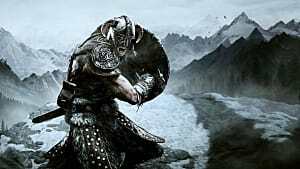 With the recent release of Skyrim Special Edition, the modding community has been buzzing to get mods ported from the original to the remaster. 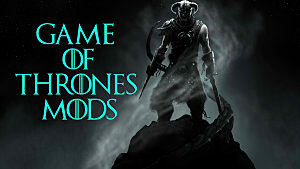 But this is also a great time to get on the modding scene for those who wanted to mod, but never did. 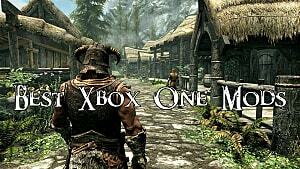 But most aspiring modders have the same question -- how do I start? And while the answer may vary from modder to modder, I'm here to help you figure it out. We'll start off small and walk through the whole process with a very basic mod -- making your own custom weapon. I know it's nothing special, but we all have to start somewhere. So with that in mind, let's get started. 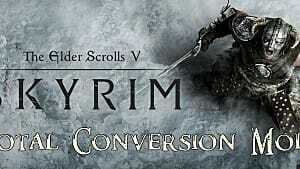 Before we can do anything, you're going to need to download the Skyrim Special Edition Creation Kit. 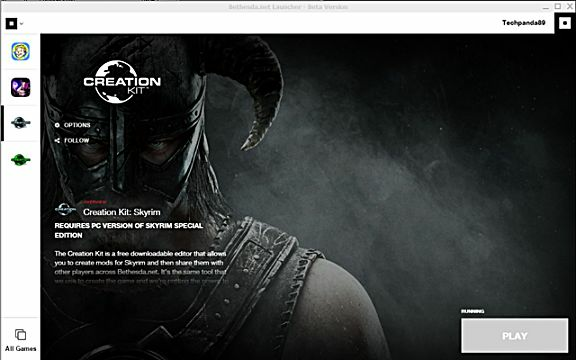 Sign up for a Bethesda.net account, then download the launcher that will have the Creation Kit. 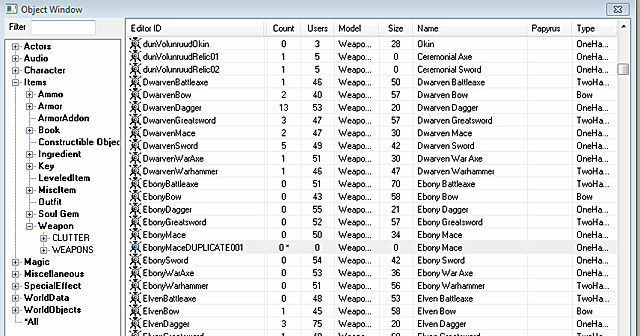 Once that's all set up, simply open the Creation Kit, go to File -> Data and double click on the Skyrim.esm file until it's got an "x" next to it. Thenhit okay. It's going to take a few moments to load everything so don't panic. 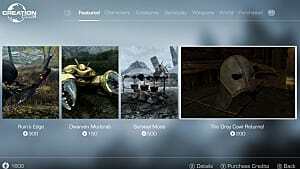 Okay, the Creation Kit is loaded and all the game assets are available for you to use. So what do you do now? Well, the first thing you need to do is pick out a weapon type. Right-click on the weapon type of your choice and chooseDuplicate Item. Now you could leave the default name here, but I'd suggest renaming it for ease of finding it later if you want to make changes. 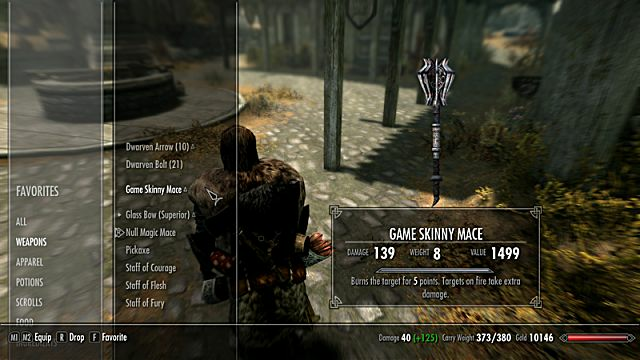 Once you assign a name to the weapon (I chose Game Skinny Mace) then we can tweak a few other things. 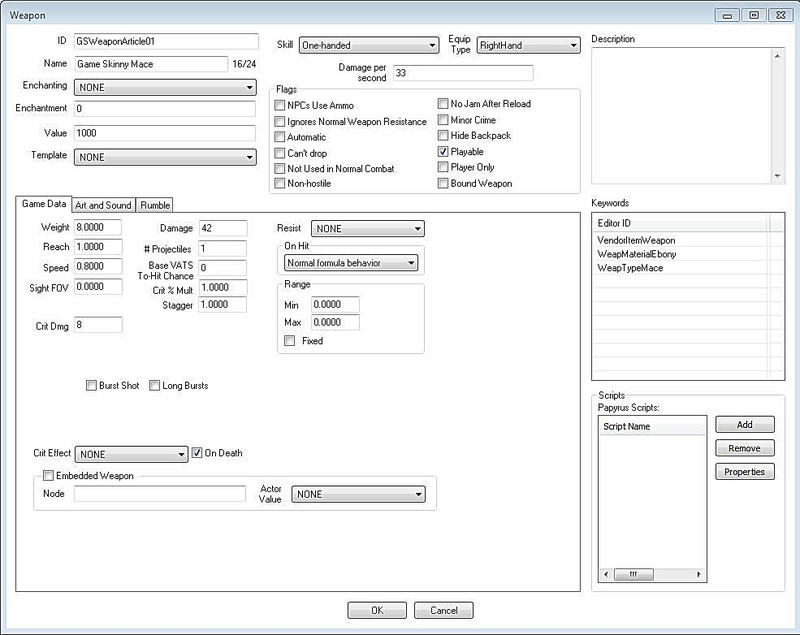 In the Game Data tab, we can change the physical and damage properties of the weapon. I cut the weight in half and increased the damage to 42, because it's the answer to life's greatest question -- just like this mace. When that's done, all you really have to do is to hit the Ok button and save. 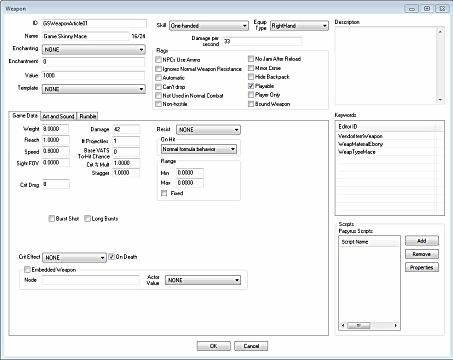 Once the file is saved, you need to add it to your load order. 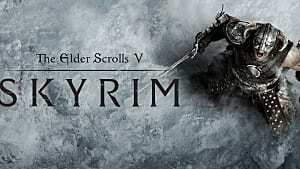 If you're using the Bethesda.net function, the mod should be at the bottom of your list. Simply set it to enabled and start your game. In a future article, I'll cover placing things into the world but for now, we're going to use the console to spawn the item into our player's inventory. To open your console press the "~" key and a command prompt will pop up. 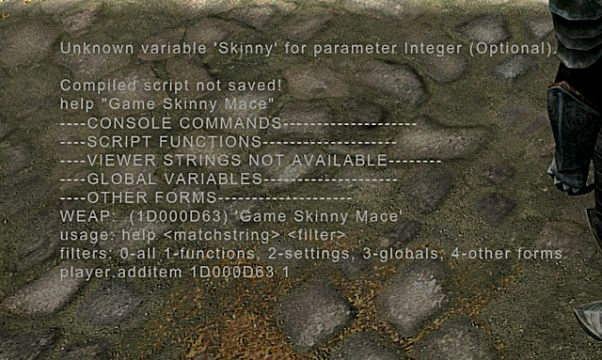 From there, we'll type in help "Weapon Name" to get the weapon's item ID (in my case I typed in help "Game Skinny Mace" which had the weapon ID of 1D000D63 but yours will be different). 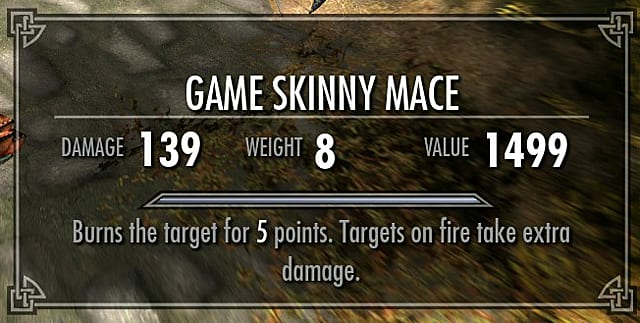 You add the item to your inventory with the command: player.additem itemID Quantity (player.additem 1D000D63 1 in my case to spawn 1 mace in my inventory). If you've done everything correctly then you should have the weapon that you made in your inventory. 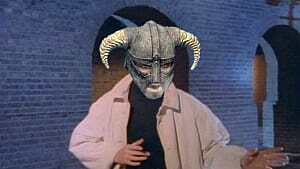 Congratulations, you made your first mod! If you got lost in all of the instructions fret not for I have made a video for those who learn by seeing, then doing. 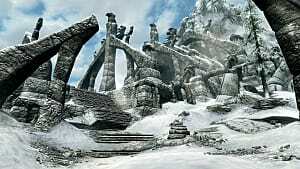 And, if you're looking for some more mods to help fill out your game, check out my previous article on the top immersion mods in my game load order.